When Blaise Pascal died, at the young at of 39, he left hundreds of his first notes for a largely unfinished text—as in Sainte-Beuve's words, a tower of which the stones have been laid on each other, but not cemented, and the structure unfinished.1 If completed, his book was to have been a a defense of Christianity. The fragments were published eight years later, in 1670, as Pensées (Thoughts). They demonstrate his genius including not only the science for which he is remembered, but they also had the nature of a psychologist and a moralist. Additional science-related Pensées can be read on the quotation page for Blaise Pascal on this site, as listed in the links below. 1 From Introduction by T.S. Eliot to Pascal’s Pensées (1958), xi. 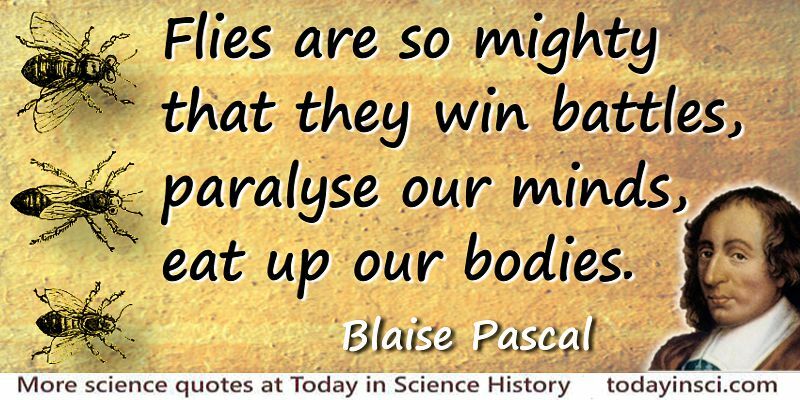 Science Quotes by Blaise Pascal.